Anthony Knockaert fires Albion into the lead. Picture by Phil Westlake (PW Sporting Photography). Brighton & Hove Albion are back on top of the Championship as Anthony Knockaert's double gave them a 2-1 win at home to Sheffield Wednesday in a thriller at the Amex. 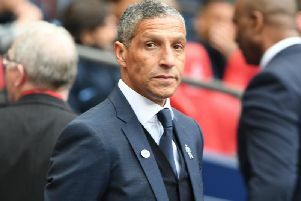 Albion took the lead through Knockaert after a stunning counter-attack on 34 minutes but Wednesday levelled through a Dunk own goal just before half-time. Brighton celebrate Knockaert's opener. Picture by Phil Westlake (PW Sporting Photography). Brighton keeper David Stockdale saved a Fernando Forestieri penalty midway through the second half after Albion top-scorer Glenn Murray was sent off for handling a shot. After surviving a spell of pressure, Albion went back ahead six minutes from time when Knockaert slid home his second. Wednesday were reduced to nine men in the closing stages as Steven Fletcher saw red for violent conduct and Sam Hutchinson received a second booking deep in injury-time. Brighton made five changes from the 2-0 defeat at Preston North End, with captain Bruno (groin) and striker Sam Baldock (calf) both late withdrawals. Connor Goldson moved to right-back and Tomer Hemed up front, with Dale Stephens, Sebastien Pocognoli, Lewis Dunk and Jamie Murphy also returning to the starting line-up. Owls keeper Kieren Westwood got down superbly to keep out Glenn Murray's low, skidding shot inside two minutes after a superb run down the right by Knockaert. Wednesday's Adam Reach saw a 20-yarder skim the side netting on seven minutes, before Knockaert again caused the visitors problems on 19 minutes but Westwood pushed away his dangerous cross-shot. Albion keeper David Stockdale was called into action for the first time on 25 minutes as he kept out Reach's fierce 22-yard drive, after a fortunate ricochet allowed the Owls winger to break forward. The visiting fans were baying for a red card when Albion left-back Sebastien Pocognoli caught Jack Hunt on the knee when attempting to clear the ball. Pocognoli was booked by referee Stuart Attwell and after a lengthy delay, Hunt was stretchered off. Brighton took the lead on 34 minutes after a stunning break. Tomer Hemed broke from inside Albion's half and released Knockaert, who appeared to over-run the ball but still managed to skip past Westwood and then composed himself before rifling into the roof of the net. Forestieri flashed an effort wide as the visitors looked for an immediate response, while Hemed drove an effort wide of the far post shortly afterwards. Wednesday levelled a minute before half-time when Forestieri's cross was volleyed goalwards by Oliver Norwood as he looked to clear and struck team-mate Lewis Dunk to wrong foot Stockdale and give the visitors a fortuitous leveller. After a cagey start to the second half, Brighton were the first to threaten when Shane Duffy met Norwood's inswinging free kick but was unable to direct his header on target from six yards after 54 minutes. The hosts had an equally good opportunity just four minutes later when Hemed's cross picked out Murphy but he could only head straight at Westwood. The tide quickly began to turn and Wednesday's Ross Wallace drilled a free kick at Stockdale on the hour, before Pocognoli bravely denied Owls substitute Steve Fletcher a minute later. With the pressure mounting, the visitors were awarded a penalty on 65 minutes when Glenn Loovens' shot was handled by Murray and Brighton's top-scorer was sent off for deliberate handball. Forestieri's spot-kick was superbly kept out by Stockdale, diving to his right, and Albion's keeper also turned the Wednesday striker's follow-up wide. With the game all one-way traffic, Wednesday's Barry Bannan rolled a shot across goal on 71 minutes. Albion soaked up the pressure and began to look more of a threat after the introduction of fresh legs in Steve Sidwell and Solly March. The hosts went close when Hemed was just unable to reach a teasing Pocognoli cross on 84 minutes, before they took the lead for a second time a minute later. Pocognoli sent in another superb cross from the left and Knockaert slid in to turn the ball home at the back post. Wednesday were reduced to ten men a minute from time when Fletcher saw red for pushing his head into Dale Stephens' face after an altercation. They then lost Hutchinson to a second booking deep in injury-time as Albion returned to the top of the Championship. BRIGHTON: Stockdale; Goldson, Duffy, Dunk, Pocognoli; Knockaert (Skalak 90), Stephens, Norwood (Sidwell 79), Murphy (March 79); Murray, Hemed. Subs: Maenpaa, Huenemeier, Kayal, Hunt. SHEFFIELD WEDNESDAY: Westwood; Reach, Winnall (Fletcher 57), Loovens, Lees, Hutchinson, Hunt (Palmer 33), Wallace, Pudil (McManaman 67), Bannan, Forestieri. Subs: Wildsmith, Jones, Hooper, Sasso.